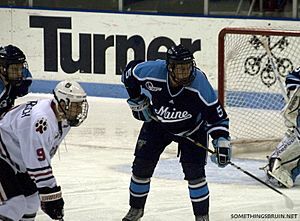 Nickname(s): "The Pine Tree State"
Song(s) "State of Maine Song"
Maine is the northeast-most state in the United States. 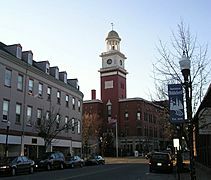 The capital is Augusta, although the city of Portland, farther south, is the largest in the state. 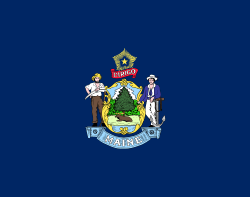 Maine became the 23rd state, on March 15, 1820. It was previously a part of Massachusetts. Commercial Fishing, including lobster trapping, is a traditional and still vital part of the coastal economy. 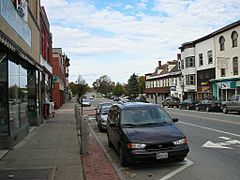 Tourism is a large industry in southern Maine because of its many beaches and picturesque coastal villages. Southern Maine is the part of the state that has the most people. Many other areas, to the North, are far more rural. Settlement of the northern borders by the Webster–Ashburton Treaty of 1842. The original inhabitants of the territory that is now Maine were Algonquian-speaking Wabanaki peoples, including the Abenaki, Passamaquoddy, Maliseet and Penobscot, who had a loose confederacy. 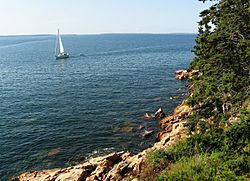 European contact with what is now called Maine started around 1200 CE when Norwegians interacted with the native Penobscot in present-day Hancock County, most likely through trade. About 200 years earlier, from the settlements of Iceland and Greenland, Norwegians had discovered America and attempted to settle areas such as Newfoundland, but failed to establish a permanent settlement there. Archeological evidence suggests that Norwegians in Greenland returned to North America for several centuries after the initial discovery to collect timber and to trade, with the most relevant evidence being the Maine Penny, a 10th-century Norwegian coin found at a Native American dig site in 1954. The first European settlement in Maine was in 1604 on Saint Croix Island, led by French explorer Pierre Dugua, Sieur de Mons; his party included Samuel de Champlain, noted as an explorer. The French named the entire area Acadia, including the portion that later became the state of Maine. 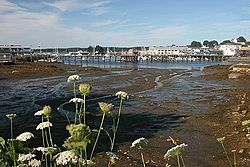 The first English settlement in Maine was established by the Plymouth Company at Popham in 1607, the same year as the settlement at Jamestown, Virginia. The Popham colonists returned to England after 14 months. 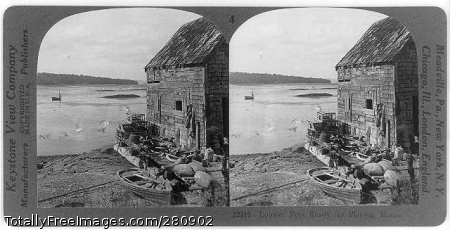 The French established two Jesuit missions: one on Penobscot Bay in 1609, and the other on Mount Desert Island in 1613. 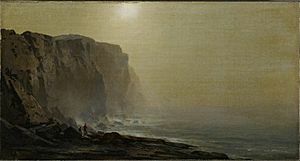 The same year, Castine was established by Claude de La Tour. In 1625, Charles de Saint-Étienne de la Tour erected Fort Pentagouet to protect Castine. The coastal areas of western Maine first became the Province of Maine in a 1622 land patent. Eastern Maine north of the Kennebec River was more sparsely settled and was known in the 17th century as the Territory of Sagadahock. A second settlement was attempted at a place called York, in 1623 by English explorer and naval Captain Christopher Levett, granted 6,000 acres (24 km2) by King Charles I of England. That settlement also failed. 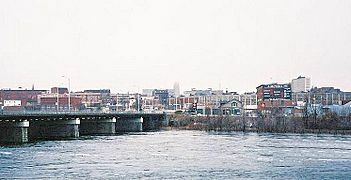 Central Maine was formerly inhabited by people of the Androscoggin tribe, also known as Arosaguntacook. 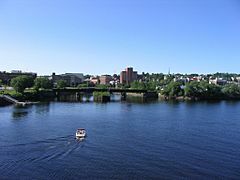 The Androscoggin were a tribe in the Abenaki nation. They were driven out of the area in 1690 during King William's War. They were relocated at St. Francis, Canada, which was destroyed by Rogers' Rangers in 1759, and is now Odanak. The other Abenaki tribes suffered several severe defeats, particularly during Dummer's War, with the capture of Norridgewock in 1724 and the defeat of the Pequawket in 1725, which greatly reduced their numbers. 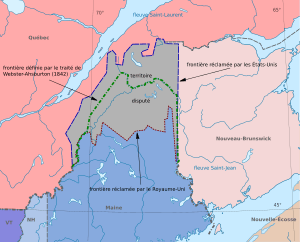 They finally withdrew to Canada, where they were settled at Bécancour and Sillery, and later at St. Francis, along with other refugee tribes from the south. The province within its current boundaries became part of Massachusetts Bay Colony in 1652. Maine was much fought over by the French, English and allied natives during the 17th and early 18th centuries, who conducted raids against each other, taking captives for ransom or, in some cases, adoption by Native American tribes. For instance, in early 1692, the Abenaki raided York, killing about 100 of the English settlers and taking another estimated 80 villagers hostage. The Abenaki took captives taken during raids of Massachusetts in Queen Anne's War of the early 1700s to Kahnewake, a Catholic Mohawk village near Montreal, where some were adopted and others ransomed. After the British defeated the French in Acadia in the 1740s, the territory from the Penobscot River east fell under the nominal authority of the Province of Nova Scotia, and together with present-day New Brunswick formed the Nova Scotia county of Sunbury, with its court of general sessions at Campobello. American and British forces contended for Maine's territory during the American Revolution and the War of 1812, and British forces occupied eastern Maine in both conflicts. The treaty concluding revolution was ambiguous about Maine's boundary with British North America. The territory of Maine was confirmed as part of Massachusetts when the United States was formed, although the final border with British territory was not established until the Webster–Ashburton Treaty of 1842. Maine was physically separate from the rest of Massachusetts. Long-standing disagreements over land speculation and settlements led to Maine residents and their allies in Massachusetts proper forcing an 1807 vote in the Massachusetts Assembly on permitting Maine to secede; the vote failed. Secessionist sentiment in Maine was stoked during the War of 1812 when Massachusetts pro-British merchants opposed the war and refused to defend Maine from British invaders. In 1819, Massachusetts agreed to permit secession if voters in Maine approved. 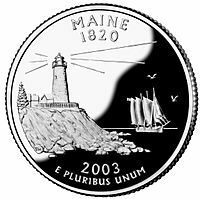 Due to these considerations and rapid population growth, in 1820 Maine voted to secede from Massachusetts. The secession and formation of the state of Maine as the 23rd state occurred on March 15, 1820, as part of the Missouri Compromise, which geographically limited the spread of slavery and enabled the admission to statehood of Missouri the following year, keeping a balance between slave and free states. 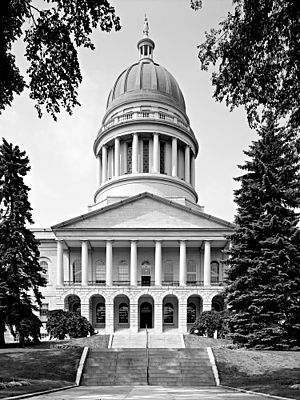 Maine's original capital was Portland, Maine's largest city, until it was moved to Augusta in 1832 to make it more central within the state. The principal office of the Maine Supreme Judicial Court remains in Portland. The 20th Maine, under the command of Colonel Joshua Lawrence Chamberlain, defended Little Round Top at the Battle of Gettysburg. Its soldiers prevented the Union Army from being flanked by the Confederate Army. Four U.S. Navy ships have been named USS Maine in honor of the state. To the south and east is the Atlantic Ocean and to the north and northeast is New Brunswick, a province of Canada. The Canadian province of Quebec is to the northwest. Maine is both the northernmost state in New England and the largest, accounting for almost half the region's entire land area. 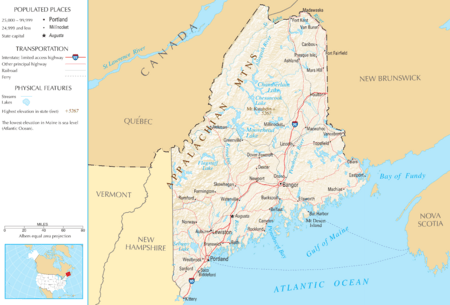 Maine is the only state to border only one other state (New Hampshire to the west). Maine's Moosehead Lake is the largest lake wholly in New England, as Lake Champlain is located between Vermont, New York and Quebec. A number of other Maine lakes, such as South Twin Lake, are described by Thoreau in The Maine Woods (1864). Mount Katahdin is both the northern terminus of the Appalachian Trail, which extends southerly to Springer Mountain, Georgia, and the southern terminus of the new International Appalachian Trail which, when complete, will run to Belle Isle, Newfoundland and Labrador. Maine has several unique geographical features. Machias Seal Island and North Rock, off its easternmost point, are claimed by both the U.S. and Canada and are within one of four areas between the two countries whose sovereignty is still in dispute, but it is the only one of the disputed areas containing land. Also in this easternmost area in the Bay of Fundy is the Old Sow, the largest tidal whirlpool in the Western Hemisphere. Maine is the least densely populated U.S. state east of the Mississippi River. Maine has almost 230 miles (400 km) of coastline (and 3,500 miles (5,600 km) of tidal coastline). Much of Maine's geomorphology was created by extended glacial activity at the end of the last ice age. Prominent glacial features include Somes Sound and Bubble Rock, both part of Acadia National Park on Mount Desert Island. Bubble Rock, a glacial erratic, is a large boulder perched on the edge of Bubble Mountain in Acadia National Park. By analyzing the type of granite, geologists were able to discover that glaciers carried Bubble Rock to its present location from near the town of Lucerne, Maine — 30 miles (48 km) away. Acadia National Park is the only national park in New England. 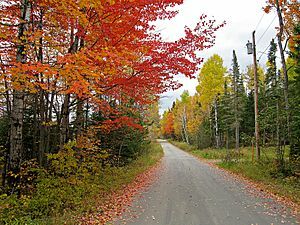 Maine has a humid continental climate, with warm (although generally not hot), humid summers. Winters are cold and snowy throughout the state, and are especially severe in the northern parts of Maine. Coastal areas are moderated somewhat by the Atlantic Ocean, resulting in milder winters and cooler summers in immediate coastal areas. Maine has fewer days of thunderstorms than any other state east of the Rockies, with most of the state averaging less than 20 days of thunderstorms a year. Tornadoes are rare in Maine, with the state averaging fewer than two per year, mostly occurring in the southern part of the state. Maine rarely sees tropical cyclones. The United States Census Bureau estimates that the population of Maine was 1,329,328 on July 1. At the 2010 Census, 94.4% of the population was non-Hispanic White, 1.1% non-Hispanic Black or African American, 0.6% American Indian and Alaska Native, 1.0% Asian, 0.1% from some other race and 1.4% of two or more races. 1.3% of Maine's population was of Hispanic, Latino, or Spanish origin. Maine has the highest percentage of French Americans among American states. It also has the highest percentage of non-Hispanic whites of any state, at 94.4% of the total population. 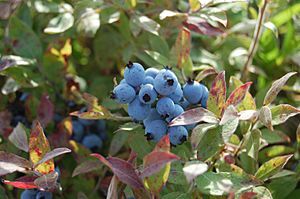 People in Maine produce agricultural goods like poultry, eggs, dairy products, cattle, wild blueberries (the state produces 25% of all blueberries in North America, making it the largest blueberry producer in the world), apples, maple syrup and maple sugar. "Aroostook County" is known for its potato crops. Commercial fishing, once a mainstay of the state's economy, maintains a presence, mostly lobstering and groundfishing. Western Maine aquifers and springs are a big source of bottled water. Maine's company outputs make paper, lumber and wood products, electronic stuff, leather things, food products, textiles, and bio-technology. Naval shipbuilding and building remain key as well, with Bath Iron Works in Bath and Portsmouth Naval Shipyard in Kittery. Naval Air Station Brunswick is also in Maine, and serves as a large support base for the U.S. Navy. 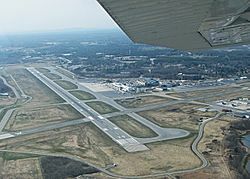 Maine receives passenger jet service at its two largest airports, the Portland International Jetport in Portland, and the Bangor International Airport in Bangor. The Downeaster passenger train, operated by Amtrak, provides passenger service between Brunswick and Boston's North Station, with stops in Freeport, Portland, Old Orchard Beach, Saco, and Wells. 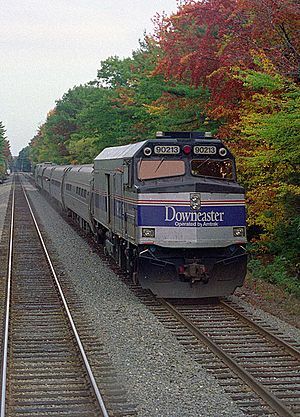 The Downeaster makes five daily trips, two of which continue past Portland to Brunswick. An organized municipality has a form of elected local government which administers and provides local services, keeps records, collects licensing fees, and can pass locally binding ordinances, among other responsibilities of self-government. 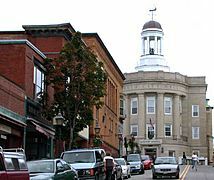 The governmental format of most organized towns and plantations is the town meeting, while the format of most cities is the council-manager form. 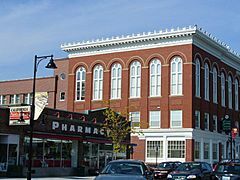 As of 2013 the organized municipalities of Maine consist of 23 cities, 431 towns, and 34 plantations. Collectively these 488 organized municipalities cover less than half of the state's territory. Maine also has 3 Reservations: Indian Island, Indian Township Reservation, and Pleasant Point Indian Reservation. The current state license plate design, introduced in 1999, depicts both the state bird and the state flower. Maine Facts for Kids. Kiddle Encyclopedia.